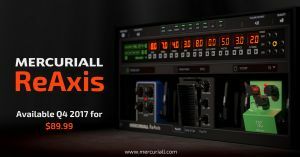 Mercuriall Audio has announced ReAxis, a new VST/AU/AAX plugin that models MESA/Boogie Triaxis (rev. TX5A) preamp, two power amps, four guitar cabinets and three microphones, a Wah-Wah based on Dunlop 535Q, several overdrive pedals and a set of the most common spatial effects. The sound of ReAxis is based on preamps of popular MESA/Boogie amps, such as Mark I, Mark IIC+ and Mark IV. One of the most interesting features of ReAxis: it is compatible with Triaxis presets, which means you can load Triaxis presets directly into ReAxis and even export them back. ReAxis includes further achievements in the field of real-time electric circuits modeling. A lot of algorithms have been reworked and improved. With the help of a tube curve tracer each preamp tube got its "personal" mathematical model. 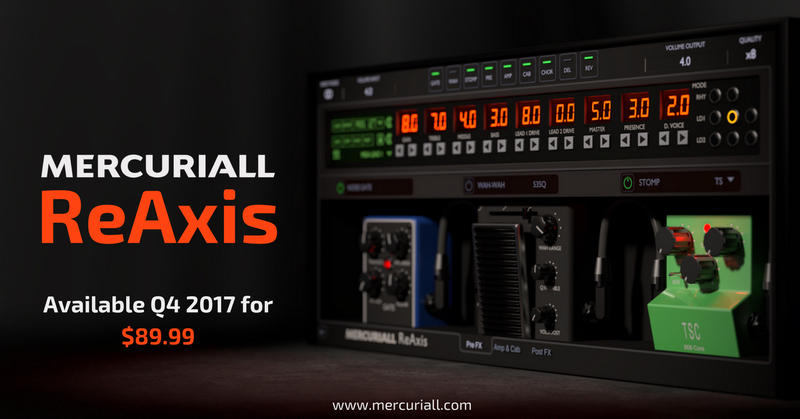 The user interface of ReAxis continues Mercuriall Audio's approach of simple usability at no expense to a wide functionality. Mac: VST Universal, AU Universal, AAX x64. PC: VST x32, VST x64, AAX x64. Based on MESA/Boogie Triaxis (revision TX5A). Push-pull, class AB tube power amp based on classic schematics. Single-ended, class A tube power amp based on classic schematics. Cab based on Bogner Uberkab 412 - 4x12 Celestion G12T-75. Cab based on Bogner Uberkab 412 - 4x12 Celestion V30s. Cab based on Marshall 1960B - 4x12 Greenback. Cab based on Marshall 1960B - 4x12 JBL K120 (vintage). Microphones: Shure SM57, Sennheiser MD441, Royer R121. Wah-Wah based on Dunlop CryBaby 535Q. Overdrive based on Ibanez TS-808. Overdrive based on Ibanez TS-808 Lower Drive Mod. Overdrive based on Ibanez TS-7 Hot. Overdrive based MESA/BOOGIE Grid Slammer. Overdrive based on Boss Super Overdrive. Oversampling: no, x2, x4, x8. Samplerate: 44.1, 48, 88.2, 96. Price: $89.99. ReAxis is planned to be released in Q4 2017.